Are you familiar with Playmobil? They have the most intricate play worlds with various themes some of my favorites are Western, Fairies, City Action, Pirates. While these larger Playmobil sets are amazing, having a toddler in the house makes it difficult for me to use them. The tiny pieces that make them lovely for older kids, are not so toddler friendly. I had kind of written Playmobil off for us until our youngest was older, then I discovered the Playmobil 1.2.3 line. The pieces in the Playmobil 1.2.3 line are chunkier and the parts are limited. Win! Toys with handles are genius, my toddler loves being able to carry the Take Along Barn around the house and set up shop anywhere. I love the small design details of these toys, like the bins that go with the recycling truck, and the luggage included with the airplane. 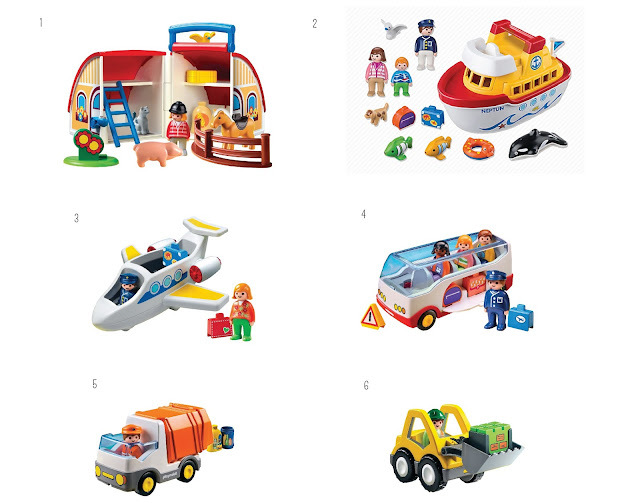 How do you feel about Playmobil? Did you grow up with it? Do you buy it for your kids? I grew up with Playmobil but my husband did not so when my mother gifted us with our first Playmobil set for our oldest he was a little overwhelmed by the set up. Anyone have a similar experience?